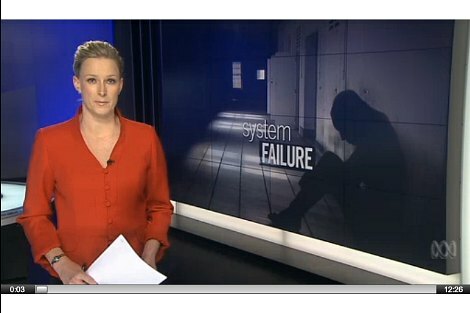 On Monday 13 and Tuesday 14 April, ABC's Australian Story and The 7:30 Report ran stories that highlighted the nation's poor mental health system, resulting too often in people reaching crisis point and taking their own lives. The stories were very human accounts of the dislocation and disorientation wreaked by mental illness. These stories foreshadowed the release of the National Mental Health Commission's Review of Mental Health Programs and Services, and the addition of mental health as an agenda item for the Council of Australian Governments (COAG). The review highlights waste in the mental health system, ambiguous reports and the inability to determine whether real and substantial change has occurred. the inclusion of mental health in Close the Gap targets for Aboriginal and Torres Strait Islander health. The recommendation to reallocate a minimum of $1 billion of mental health funds from hospitals to community-based services is interesting. While the best outcome for people with mental illness and their carers is to ensure adequate funding for both hospital and community sectors, in an increasingly cash strapped economy tough decisions have to be made about where to prioritise funding. Community based responses to mental health have much to offer — particularly respectful, person-centred, and relational responses. The importance of respecting people's strengths (recovery) and building strong compassionate relationships has been confirmed by research across cultures for over four decades and has reached its zenith in the work of Scott Miller and Barry Duncan. The key message of this line of research is that, according to the patients' and clients' perceptions, the theories and techniques of professional and clinical therapy have very little to do with therapeutic success. 15 per cent to clinical or professional techniques unique to specific therapies. While the professional training of the clinician/therapist/case manager is very important, it only accounts for 15 per cent of what clients perceive is important in their improvement. Clients and patients attribute 85 per cent of their improvement largely to other factors such as their own resilience and the quality of their relationship with their therapist/case manager. Recent studies have nuanced these findings by demonstrating that certain therapies may offer more effective treatment for specific mental disorders. Ted Asay and Lambert demonstrate a tenuous association between exposure and treatment for phobic disorders. Nevertheless, the authors contend that typically, there is little or no difference between therapies and techniques in relation to clients' perceptions of improvement. Community based mental health providers focus on providing excellent services based on respect for the individual, a belief in hope and maintaining positive relationships. Do these concepts sound familiar? They should. They are at the heart of the gospel and evident in parables like 'The Good Samaritan'. They are codified in Catholic Social Teaching principles like the dignity of the human person, respect for human life, human equality and participation. Too often, faced with increasing complexity and professionalisation, the Church has backed away from engaging people with mental illness, thereby, unintentionally further marginalising them. The research above indicates that local parishes and faith communities may have an important role to play as they seek to live out the gospel and practice the principles of Catholic Social Teaching. All of us can offer sincere respect and engage in genuine relationships as we support people with mental illness and their carers. When we feel out of our depth we can partner with mental health professionals — be they hospital and/or community based services. For the Church it's also about recovering a confidence in the Gospel, the importance of the Church as a Eucharistic community of virtue, in part, as a broadly 'evangelical' response to Western Society's increasing wrestle with mental illness. Paul Jensen is CEO of Centacare in the Catholic Diocese of Wagga Wagga. If the Catholic Church wants to view an organisation that has melded Catholic Social Teaching and the care for the mentally ill look no further than Catholic Psychiatric Pastoral Care in Brisbane. This is a ministry of Centacare dedicated to the mentally ill, in hospitals, hostels and a dedicated centre in Fortitude Valley with well over 50 specifically trained volunteers and full time chaplain. An important aspect regarding mental health that seems to be by-passed is that 'Prevention is better than cure'. We are all born with various dispositions and inclinations, some of which will need encouragement if they are to develop appropriately. Society is becoming less effective in providing the conditions to help ideal development, and it is left mainly to parents, many of whom are not well equipped with the techniques needed to ensure desirable outcomes. More work needs to be done to fit them out for the responsibilities they face. People I have known with a mental health issue have (and usually still do) experience bullying, exclusion, feeling a failure because they can't meet others expectations. a feeling of powerlessness. Families and schools need greater skills to recognise and attend to these issues in youth. Let's not deny the effect of alcohol and drugs use in the teenage years. Some mental health issues can be attacked in the bud. We do not forget experiences but we can learn to incorporate them into our lives in a positive way. Jesus reminds us He did not come to destroy the world but to save it. His message is life-giving. I'm a person who goes around saying "It's all about relationships"! at every opportunity. Paul Jensen's insightful article gives a factual basis to my polemic. His last sentence Is enormously important for the health - mental, physical, spiritual - of the world. Thanks, Paul. The government wants people with mental illness to return to work but ignores the difficulties involved. There needs to be constant mentoring and counselling of people who return to work and the assurance they will be able to return to the disability pension if/when things don't work out. Perhaps this is one area the Church may get involved. There are many people with a mental illness who are well educated, with lots of skills and who could make a contribution of society. As it is they feel on the scrap heap and feel there is no future for them in a society that so values what we do, rather than who we are. the Compeer program, which seeks to partner 'normal' people with the mentally handicapped was started in Rochester, NY many years ago, and has been tried in Australia as well, eg Corrimal, NSW. It works rather well. I grew up in a NSW farming community where my parents’ families were well known and respected. My father’s manic depression (bipolar disease) manifested when he was 22. Shamefully, no one in the Catholic community, or in his family, visited or offered any support over the years when his mania hospitalised him, often for months. Surprisingly, the usual people who turned up to help him and us (wife + three kids) were outsiders - once, the Anglican minister father of my school friend. Shamefully, the parish priest never once visited in all those years, despite we being involved in the parish. Nor did my father’s priggish Catholic family, or a single person from the parish. Dad’s very public mania was an embarrassment. My mother became embittered at the Church and refused to attend Mass during my teenage years. But, at 12, I could understand. We kids would sit with Dad in the almost-back row, embarrassed all over again by Mum's deliberate absence. I teach my own kids that charity and care begin at home. I strongly believe this simple rule needs to be applied first and foremost at the Parish level, as well as in our own homes. Parishes, like all organisations, are shaped by their leaders. So, parish priests: please get out there and show that you care for and respect every family in your community. Danny, I couldn't agree more! One of the times of greatest learning and privilege in my life was to be among the carers at Catholic Psychiatric Pastoral Care at Fortitude Valley. These days I live in Sydney but my whole outlook is coloured by that experience. At the heart of the CPPC ministry is Gospel love and dignity for each person. It's taken years of dedication, prayer, patience as well as continued learning from professionals and from practical experience to build up a whole approach that really works. Here's to Father Jim, Janine, Carers and Members! I had a bout of severe clinical depression in 1994. I was suicidal. I asked the Priest at my local RC Church - which I regularly attended - to visit me at my home. He came, but soon left. He just did not want to know about it. Just shook his head, and left. Unbelievable. They have NO idea. Louw, I don't think "church" necessary has to mean "priest" when asking for some support for the mentally ill. Knowing the temperament of my parish priest growing up, I think he'd be the last person I'd want to visit if I was clinically depressed. I think "church" here means "people of God" rather than clerical hierarchy.